Bronzino paints a picture of a fat Medici kid with his dead bird. Combining Bronzino's cold and detached style with a portrait of a child is the perfect recipe for something particularly creepy. Add to that a goldfinch that is more than likely less than lively clenched in the child’s pudgy hand and the heebie jeebie factor goes off the chart. It’s this juxtaposition of childhood innocence, the look of being freshly exhumed, and the opulent garb of Giovanni that makes it difficult to look away from this portrait. This is a portrait filled with the potential of being born into nobility. This well-fed child with his bright, but still somewhat dead, eyes gaze into an unsure future. His place in dominion over everything, including the natural world, is set. Giovanni’s plump dimpled knuckles, double chin, and the appearance of little baby-jowls is as much a portrayal of Renaissance affluenza as it is the documenting of a life about to launch. By the time he hit puberty, he became the Archbishop of Pisa. By the age of seventeen, he was promoted to Cardinal. Though seemingly destined to live a charmed life, Giovanni would never live to see his twenties. Instead, like the child of a modern-day-anti-vaxxer, poor Giovanni succumbed to malaria at the age of 19. The Portrait of Giovanni de' Medici as a Child (c. 1545) is an oil on panel painting by the Florentine artist Agnolo Bronzino. It is currently located at the Galleria degli Uffizi in Florence. This portrait uses oil paint on panel and portrays Giovanni di Cosimo de’ Medici. It was painted for his father, Cosimo I de’ Medici, Grand Duke of Tuscany. Bronzino was the official painter of the Medici Court from 1532 and did many portraits of Duke Cosimo I and his family. Cosimo had his portrait done by Bronzino around 1545, the Portrait of Cosimo I de’ Medici. Giovanni and his mother Eleonora of Toledo were the subjects of another portrait by Bronzino from around 1545 or 1546, the Portrait of Eleonora of Toledo and Her Son. 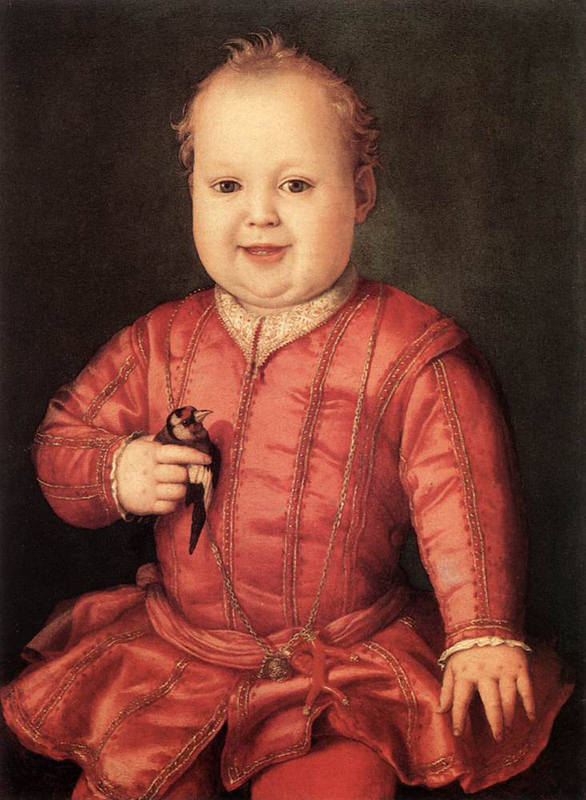 Check out the full Wikipedia article about Portrait of Giovanni de' Medici as a Child.